The title of this post says it all. I am going to show you how to install upper cabinets, and this officially makes the laundry room a construction zone. When I took the above picture, notice the washer is on and running. We were out of commission for the washer and dryer for one week. I have a family of 5, you do the math on the mounds of dirty laundry. Since getting them set back up on Saturday both have been running none stop. 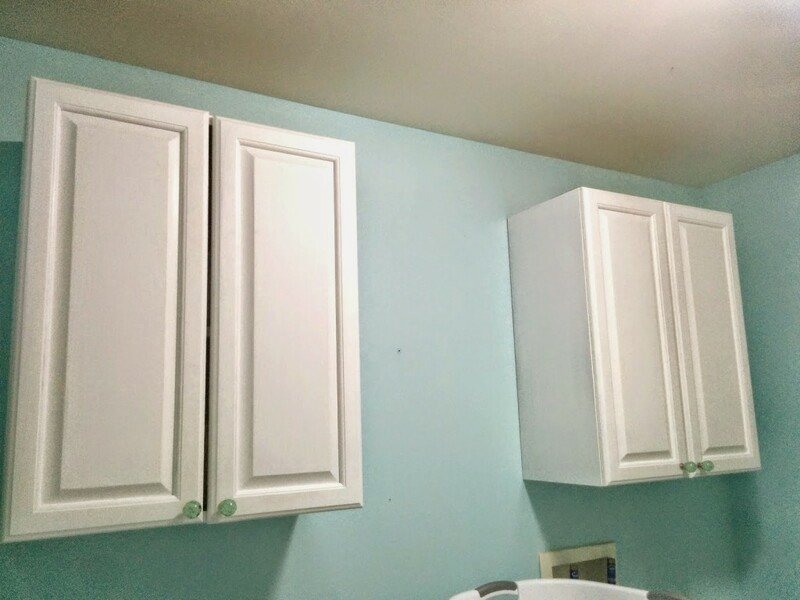 No, the removal of them was not needed to install the cabinets. But, the other things we are doing made it necessary to do it. Yes, we made this project bigger then planned. I am sure NO ONE is surprised, we do things small and then they always grow. But, more on that later. I have spoken about the laundry room overhaul. We are doing some re configuring of the space. 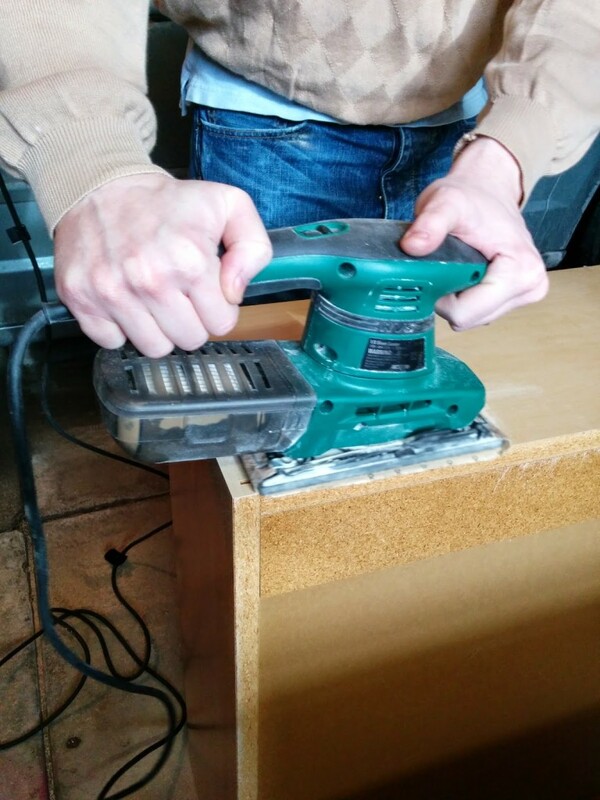 Taking down one cabinet in a nook (for a purpose I will reveal later). But, when you have a family of 5 taking down storage space is never a good thing. I racked my brain on how to resolve this and realized the answer was in my basement. The magical basement that seems to have just what I need. When we purchased the house there were these kitchen like cabinets on either side of the fireplace. For extra storage. We took them down right away and placed them in the basement, with a plan to use as organization and storage. The aha moment came when my bright self finally put it together that we needed a storage solution, we have perfectly fine upper cabinets waiting to be wall mounted. We also had ample wall space above the washer and dryer. I am embarrassed to say how long it took me to put the two together. It does not matter, we got there. We made sure they would fit in the laundry room. Took the hardware off, by simply unscrewing where there was screws. On the right is the sanded side, on the left is the un sanded side. This is ready for paint. I forgot to mention the sanding was needed so we can paint it. The cabinets would have been fine as is, but I wanted them to match some other details we have going on in this room. 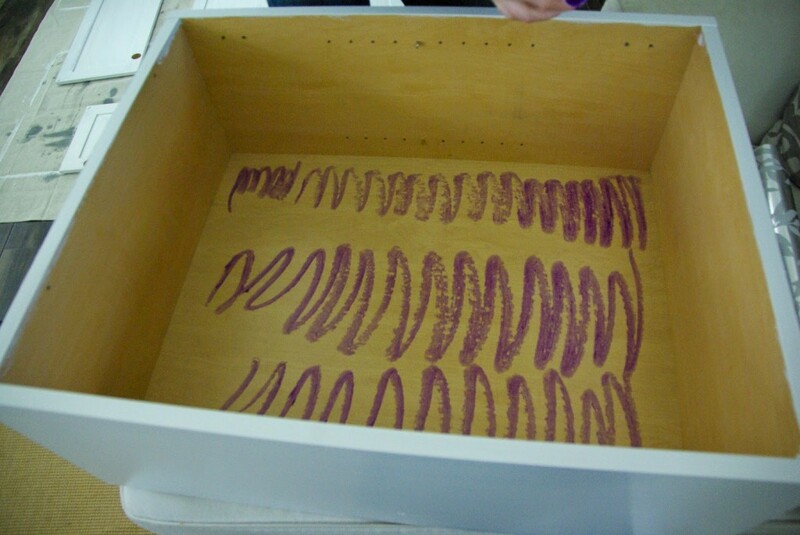 Sanding it allows the finish to come off, and creates a rough surface for the paint to adhere to. Painting this is pretty basic. Don’t rush, don’t clump, don’t glob, don’t pass go…. 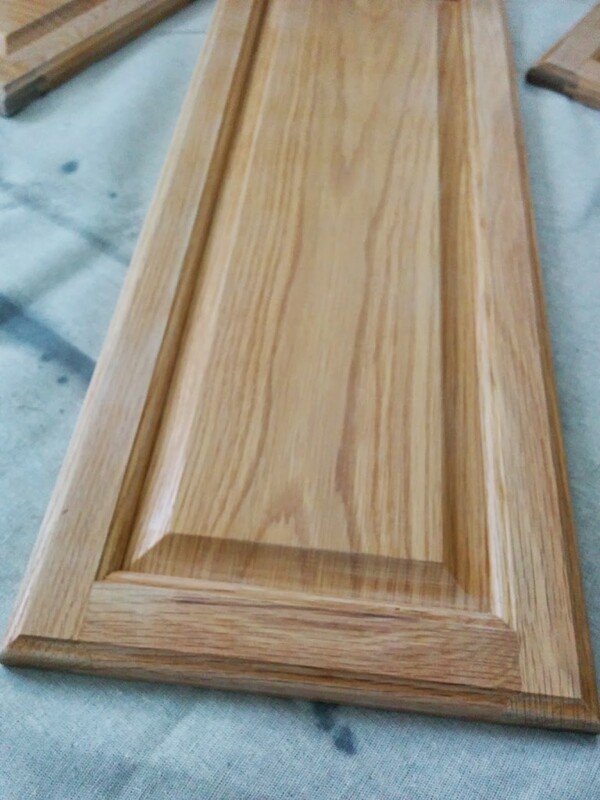 We ended up doing two coats, with three going on the door fronts. This gets most of the paint stroke lines out of the way. 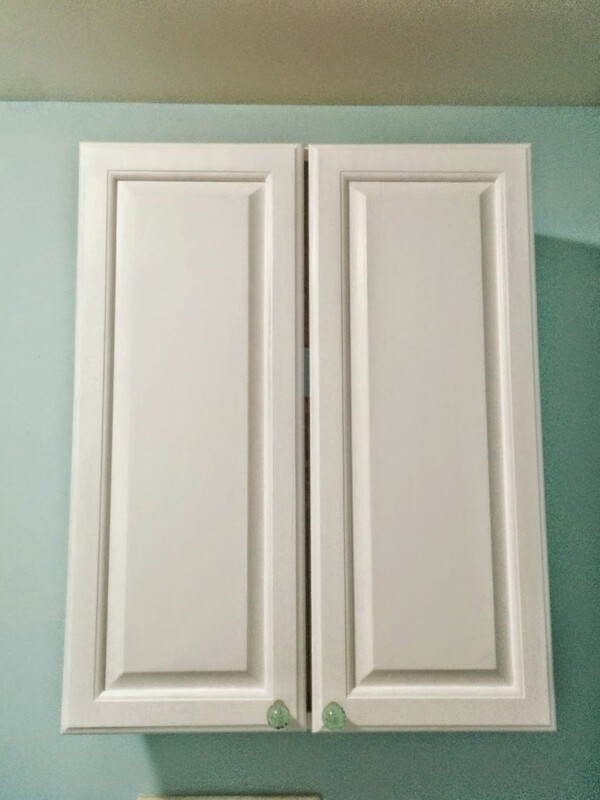 They stay hidden, and it appears we have some white cabinets that were made to be white. Paint strokes make it look like amateur hour. Which we are, but you have to fake it to make it. We usually paint outside, but when you live in Wisconsin and it is colder then our freezer (no joke) in winter outside. Paint does not work the greatest in the cold temperatures. So we laid down a drop cloth and began the painting in the comfort and warmth of our temperature controlled living room. 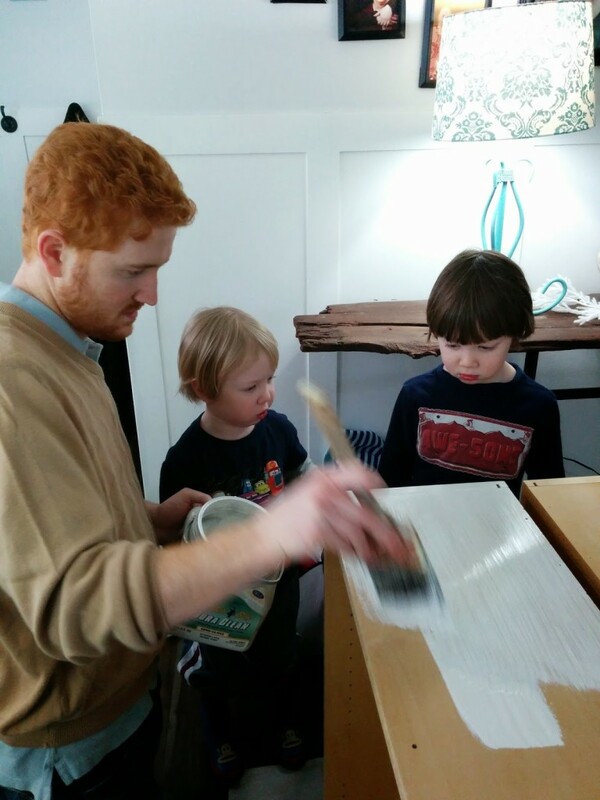 The kids became interested once paint was brought out…. 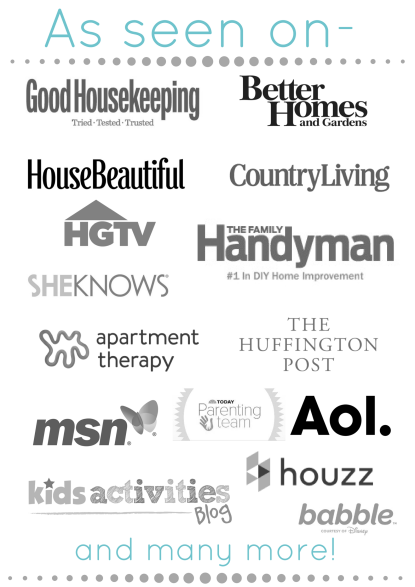 …we put them to work…. 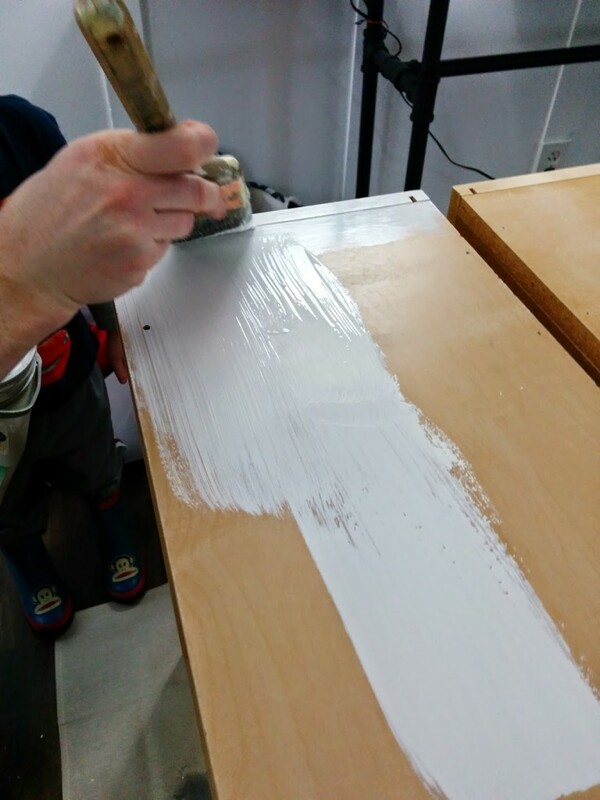 We let the kids work and paint away on the first coat. Because, while my kids are adorable little assistants. Getting them to paint in one direction, with minimal paint strokes is impossible. 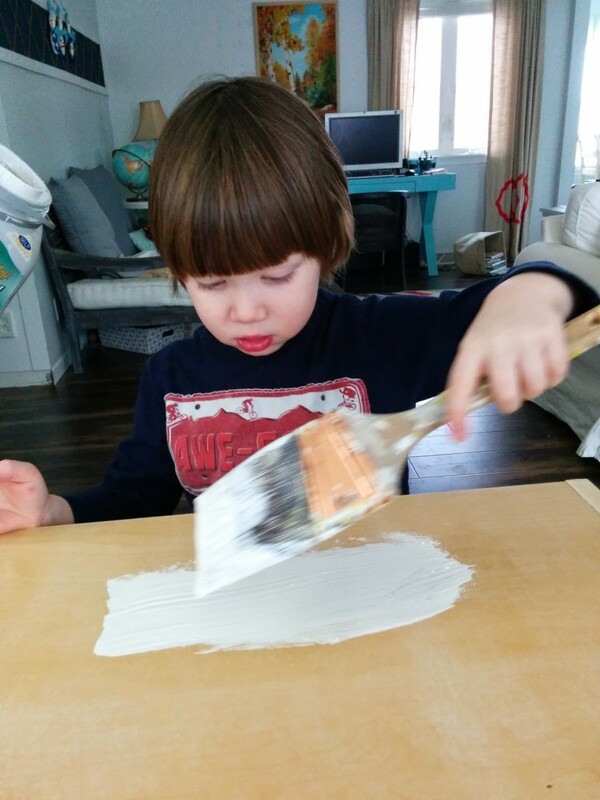 Say paint in one direction and they assume you are talking about a certain British boy band that my kids love. One direction?! Where? Is music on? They get distracted easily. This is after one coat, notice the lines and brush strokes. Cover those up. I got crafty while waiting for the doors to dry. I used some wrapping paper. I know, this is serious crafting stuff. I will note that this paper appears less shiny in real life. I guess in wrapping paper world the camera adds shiny? I laid it over the top of the cabinet. Cut it appropriately. Raided our kids art supplies for some standard glue. Dale got creative and made little designs in it. Push the paper into place. There was a slight fold where there was some excess paper. We grabbed a pocket knife Dale has and ran it along the seam. 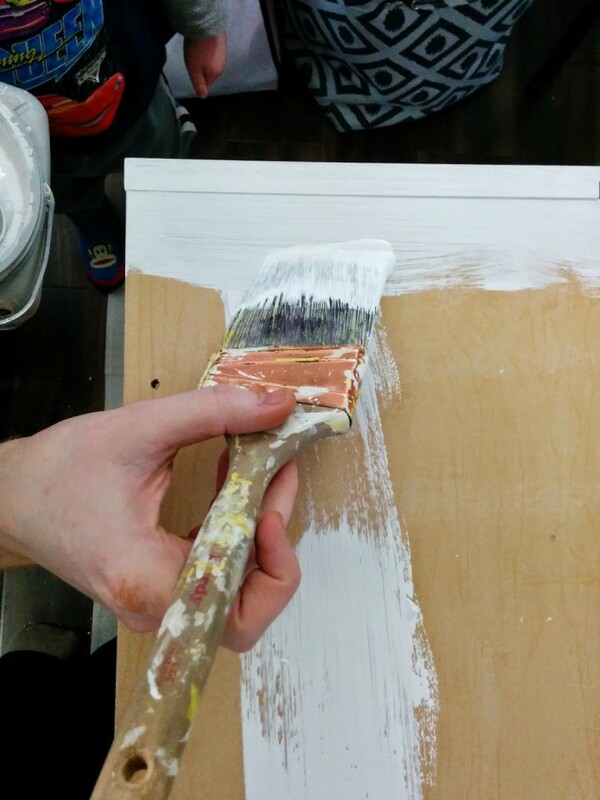 Creating the perfect edge and corner. Who needs wall paper? I just use wrapping paper, a whole lot cheaper! Next it is time to get the cabinets up. We used a really professional setting to get this done. A laser level propped up with stuff on top of washer. I know, the professionalism astound me too. 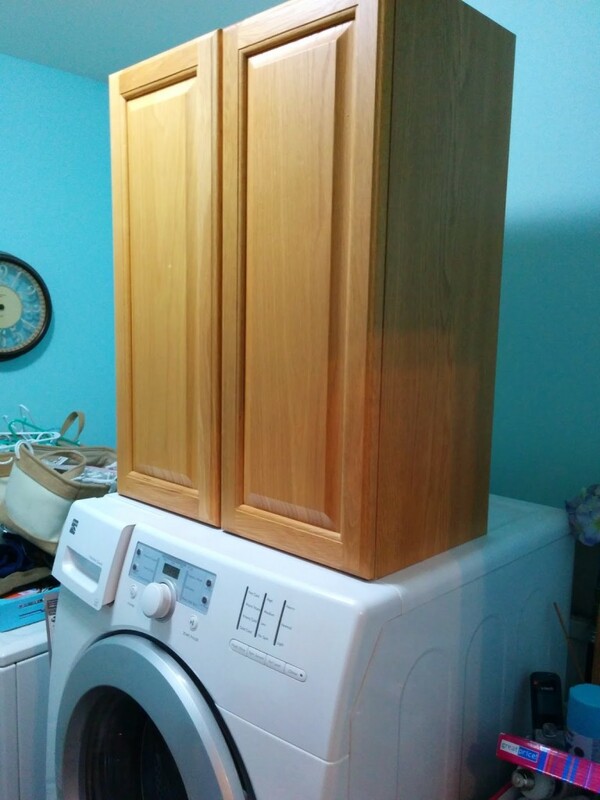 We figured out how high these should be by testing if I was able to reach into them by standing in front of the washer. If they are not accessible there is no point in putting them up. Then, with us only having two, we needed to evenly space them on the wall. Marking more or less where we wanted them to be. I say more or less because there was some adjustments needed to be made once we found out where the studs were. 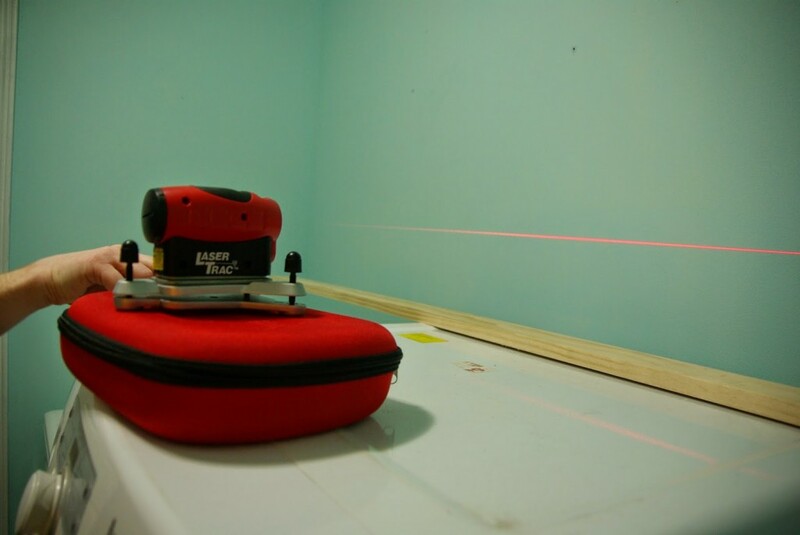 Leaving the laser level on, taking the stud finder and running it along the wall. 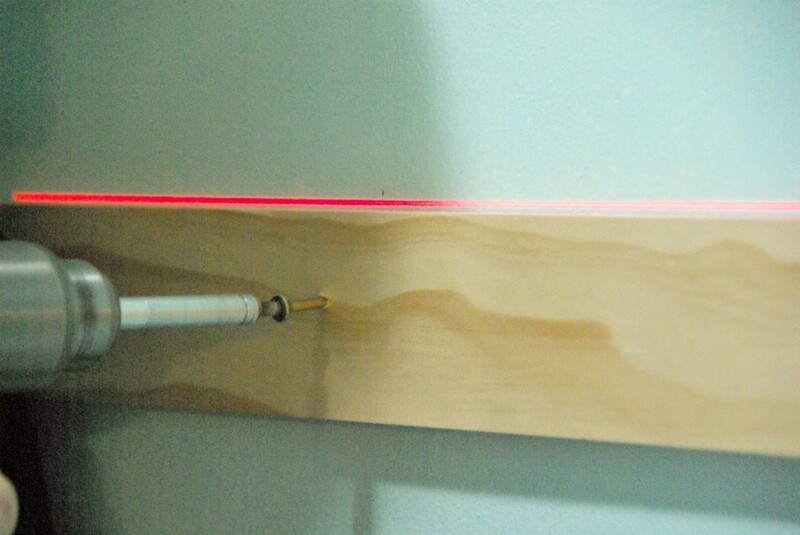 Marking each spot the stud finder lights up, showing where a stud is. 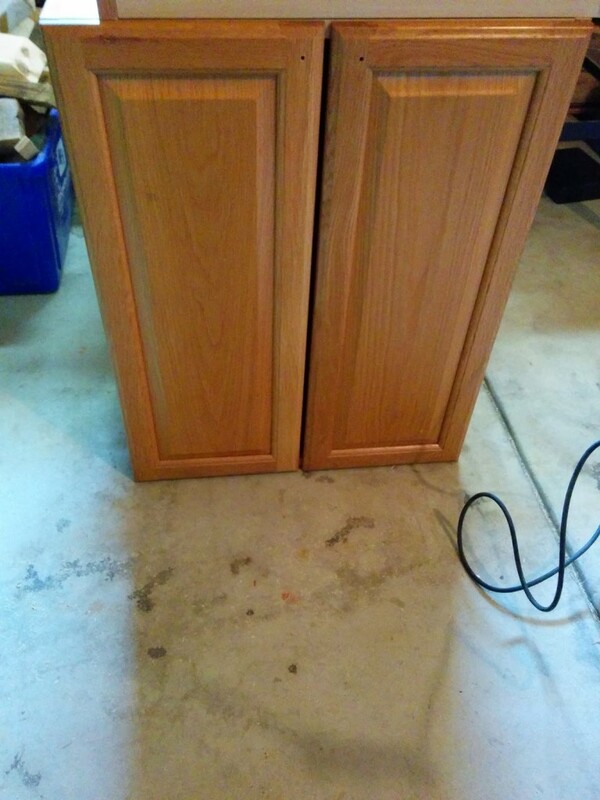 This is all being done along the bottom of the line where you want your cabinets to be. 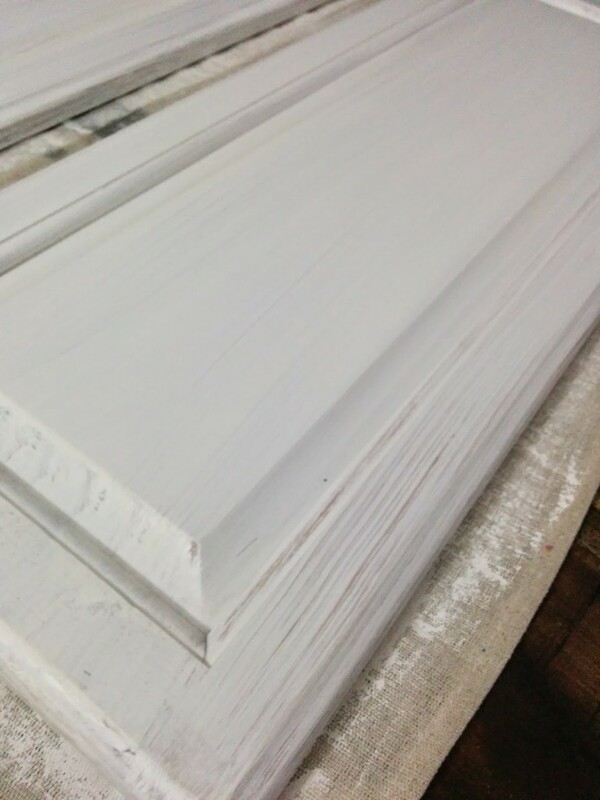 This will be a support bar to help in assisting the installation of the cabinets. Next, screw in the support bar where the studs are. 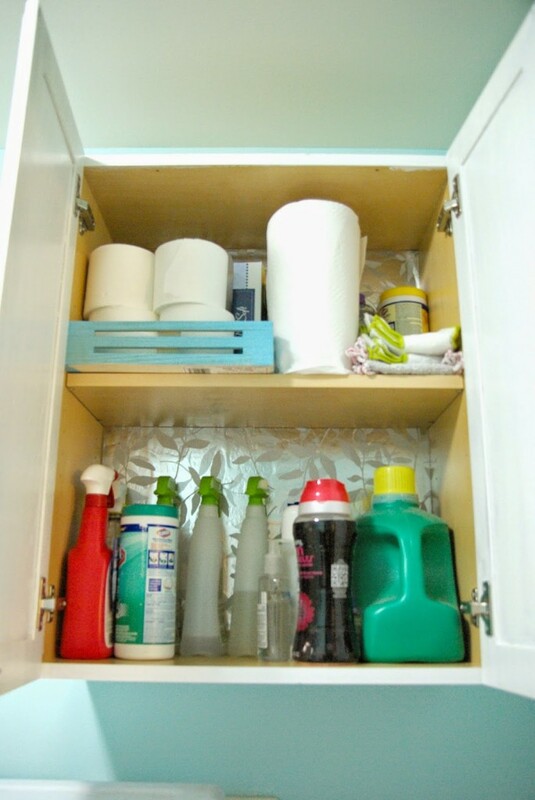 This ensures that it will be secure and heavy enough to hold the weight of the cabinets without ripping down your wall. Life hack, can’t find your leveler tool. 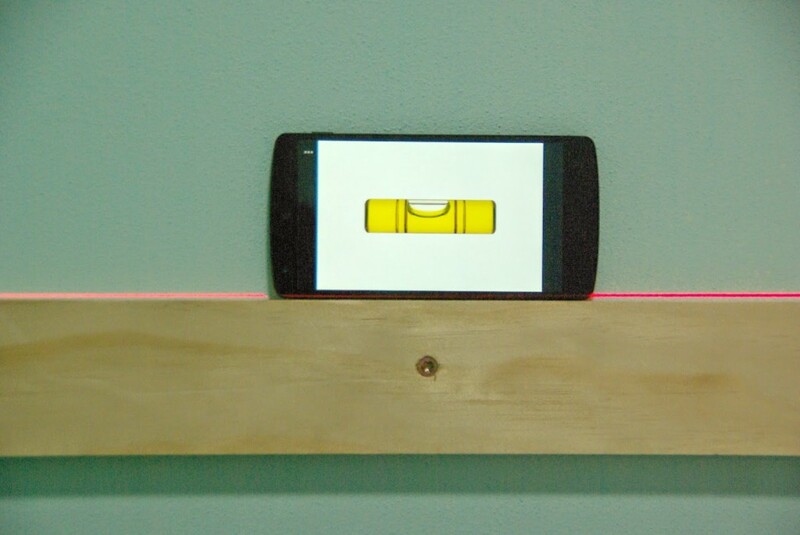 Our phones have a leveler app. This is good and level! I found the stud, this fine man is the #1 stud! 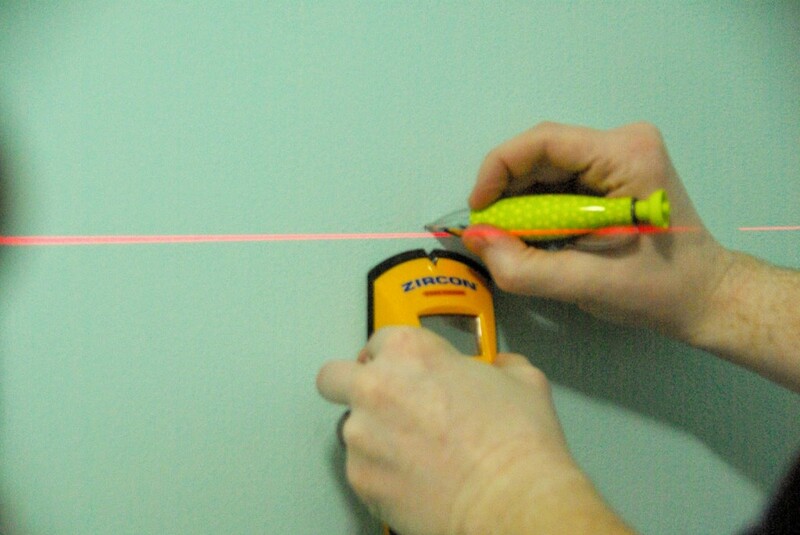 No stud finder needed for this. I love this man! This stud is placing the cabinets on the support bar. All while posing for the camera, work it! 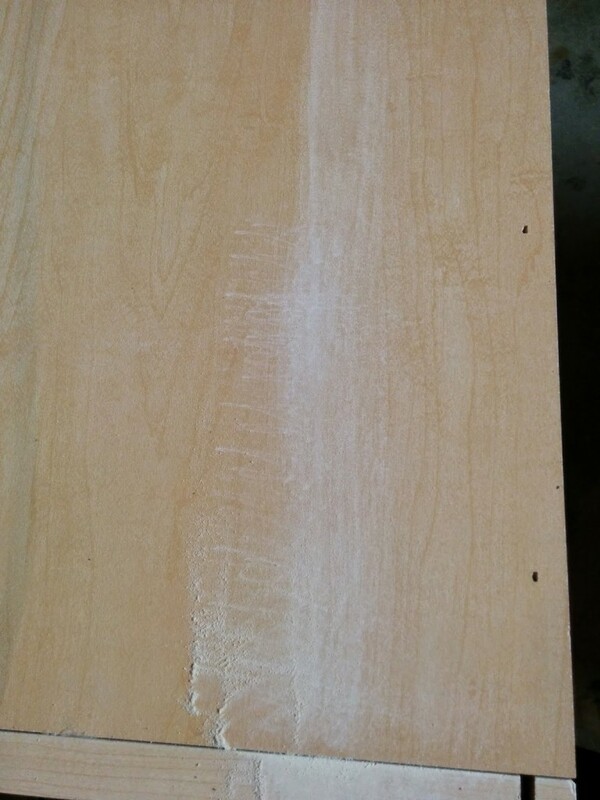 He marked where the cabinets hit, the top of them. 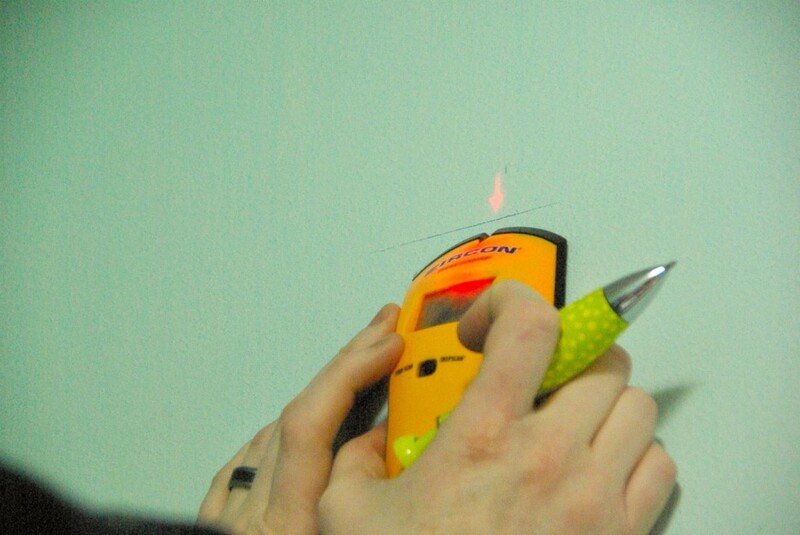 Then using the stud finder again to mark where they are. 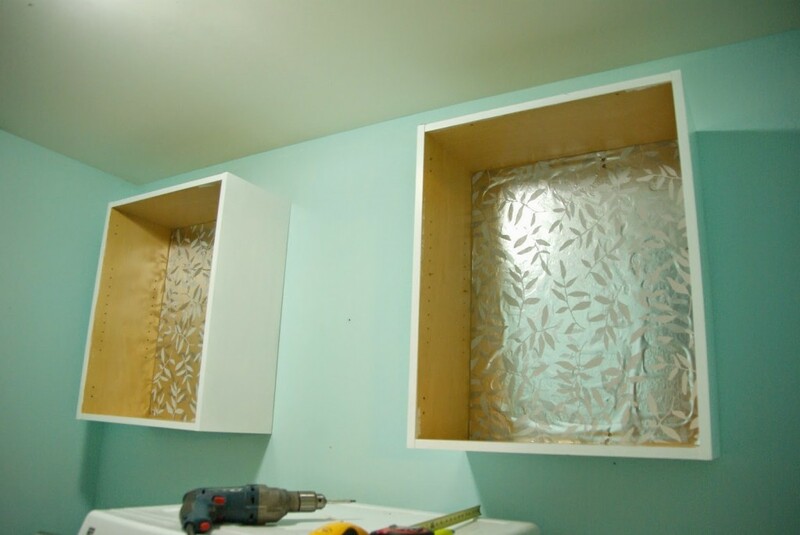 It is important to place the cabinets with studs. Studs are the 2×4’s within the wall. 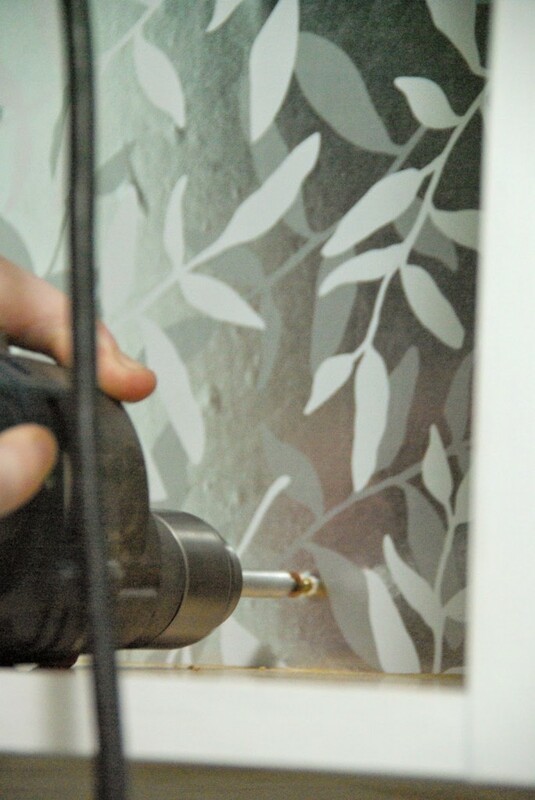 If not screwed into 2×4 (studs) the cabinet will just be attached to the thin dry wall. Which will not hold for long, if at all. Once adding all of the stuff I will pile into these, it will end badly real quick. 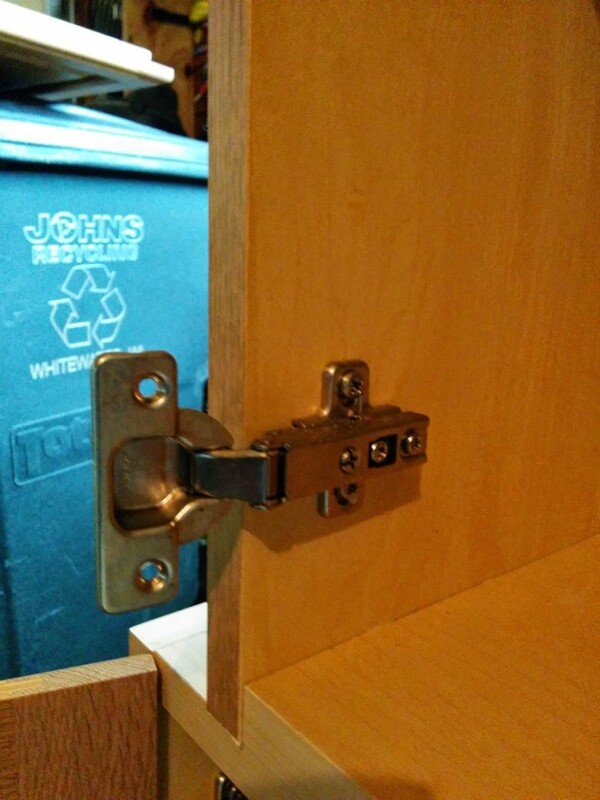 If studs are not an option you can always use a wall anchor. But, securing to a stud is always the best option when hanging heavy things, or with anything that will be holding or storing lots of stuff. Placing the cabinets on the support bar, then screwing into each corner, on the inside of the cabinets. You will be able to feel if you have hit a stud. It will take a fair amount of muscle to push it in. Which Dale has plenty of! 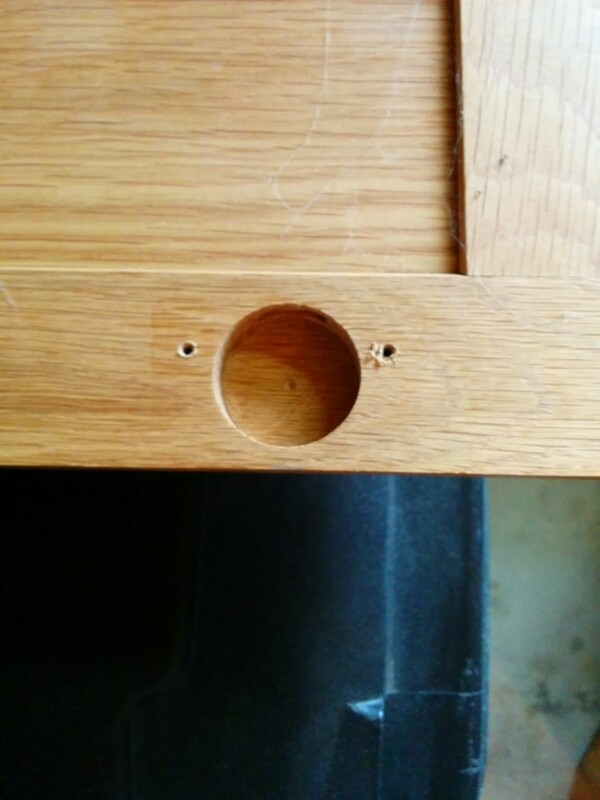 If the screw goes in with no fuss, you might want to check again to make sure you actually hit a stud. They are secure. We unscrewed the support bar and I held my breath, picturing the support coming out, the cabinets coming down. And the wall crashing down, which would make the house become rubble because I imagine this wall as the sole support of the whole house. You go there too right? But, Dale is awesome. The stud finder did it’s job and the cabinets are up! Success! We set the two shelves back in. Screwed the doors back on. 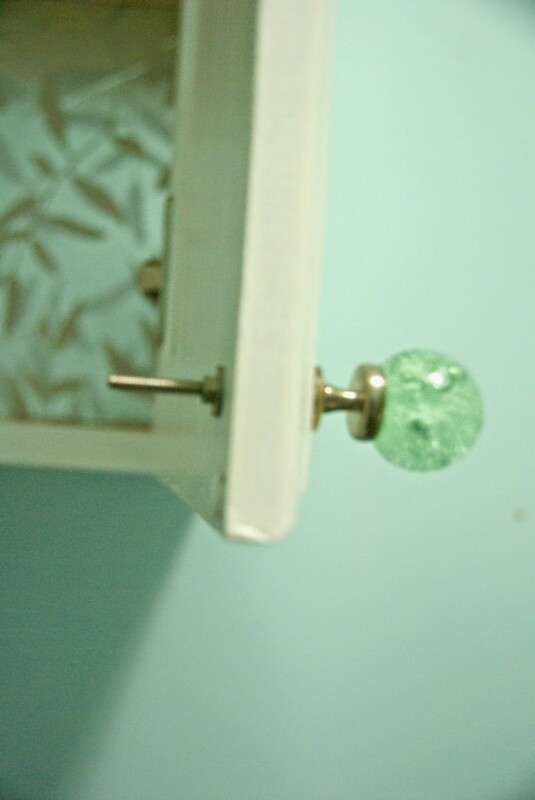 I purchased these beautiful light green cabinet door handles from a antique store. 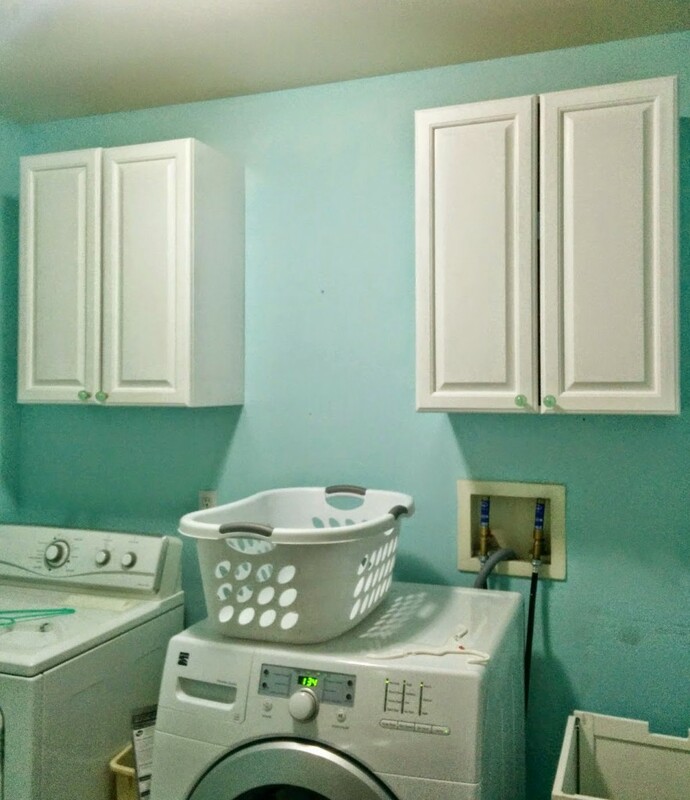 No we do not have much of any green in the laundry room, but they were too pretty to pass up. I can add some green with a picture and accessories to make it work. We marked where they should go, drilled a hole and screwed them into place. 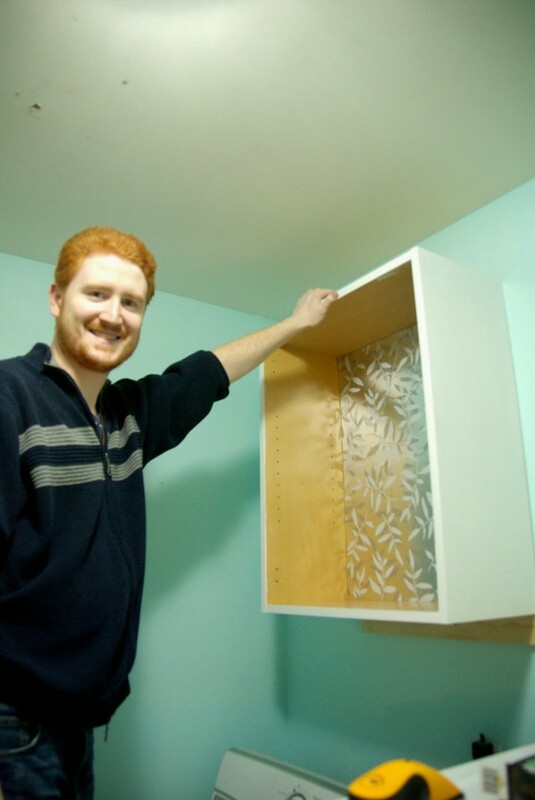 Adding cabinet door hardware is a quick, and low cost way of changing or dressing up a space. This alone would have made the cabinets look more custom. We were lazy and did not paint the inside of the cabinets. I know, it looks sort of bad. But, It does not bother me enough to do much about it. The inside of these have a lot of stuff in them. 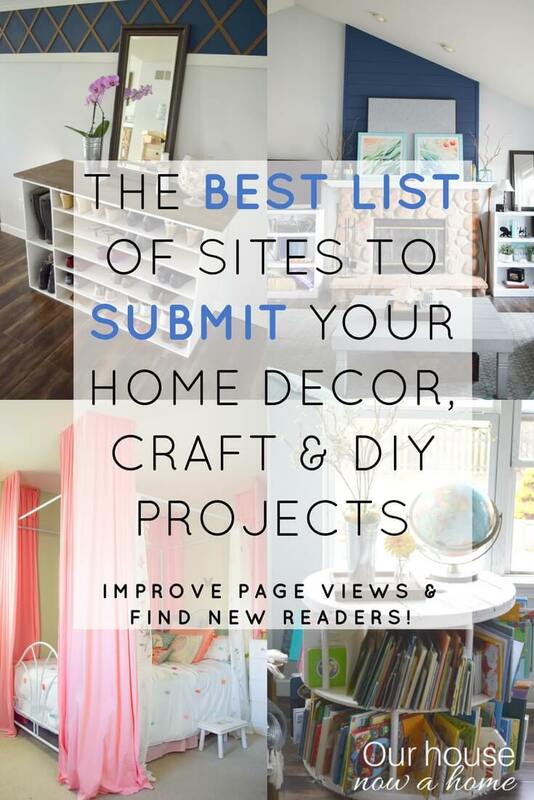 I will be organizing them and making it a lot less clutter, a lot more pretty. Before I do that there is some more shelving, storage and organizing happening. Everything will have a home. 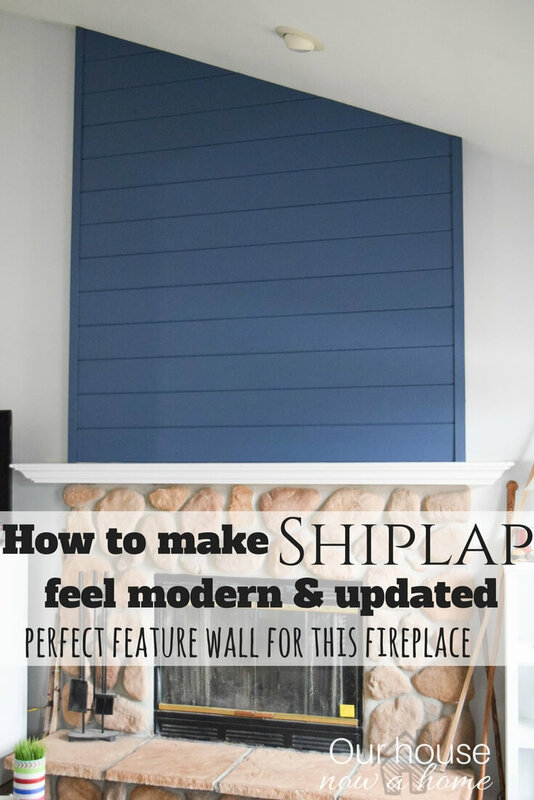 This is the functional and necessary phase of the remodel. It works, it functions, it has room to store stuff. Call it a day. For now. This laundry room redo is a marathon instead of a sprint. 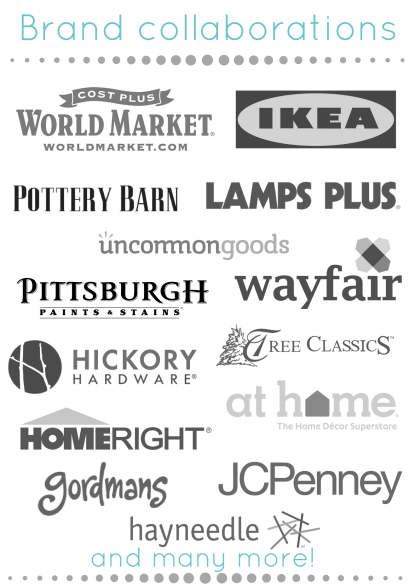 We have done a lot for work in here already, but we have A TON of stuff to do still. I am beyond giddy when thinking about the plans. I want it done now! But, you know, life, work, budget, supplies, time, kids, shoulder injury, time, kids…. prevents us from just knocking this out. These cabinets do look pretty in there. 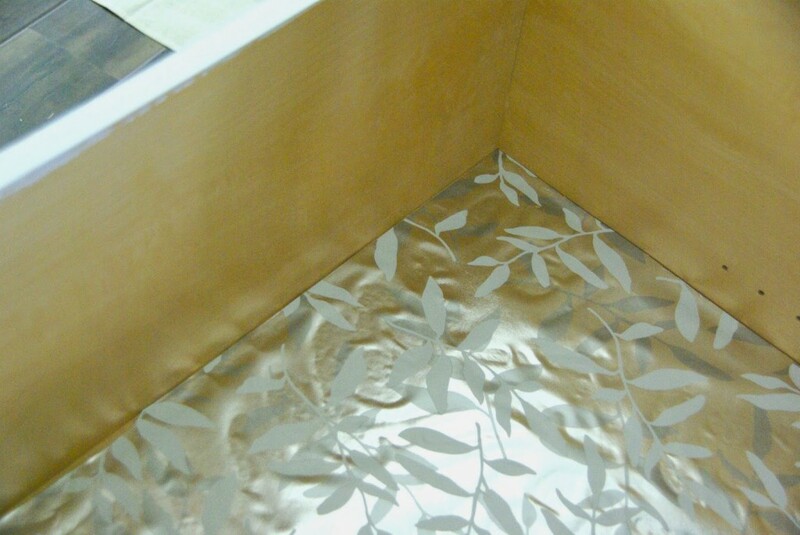 Because we got the cabinets for free, it cost me $12 to do this, including the wrapping paper. They make the space much more functional. I will be towing the line of keeping it functional, adding storage, but keeping it as clutter free as possible. This is a small space with no natural light. It can feel like it is closing in on you very fast. I will be adding some more storage to this wall. Also a work station. The washer has been taken off of it’s pedestal for the purpose of creating the work surface. Like I said, I am giddy about this. Lot’s of work, tutorials, custom pieces, imagination, function and some pretty will be added. This is a slow burn for you guys, and for me. We are working on it, however it is never fast enough. I have a ton of ideas and sketches, some really creative and new ways of making it function. 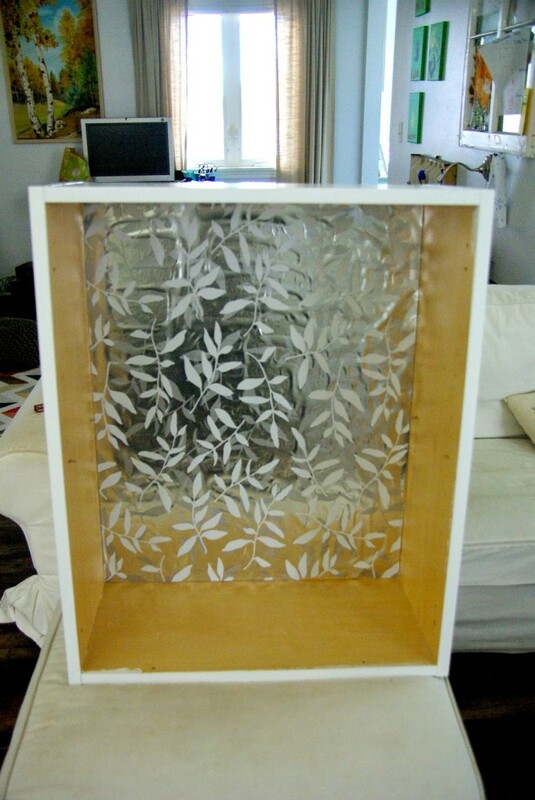 My handy man Dale will be making some one of a kind pieces for this. For a software architect he moonlights nicely as a handy man. These cabinets are the first of MANY things to come and share. 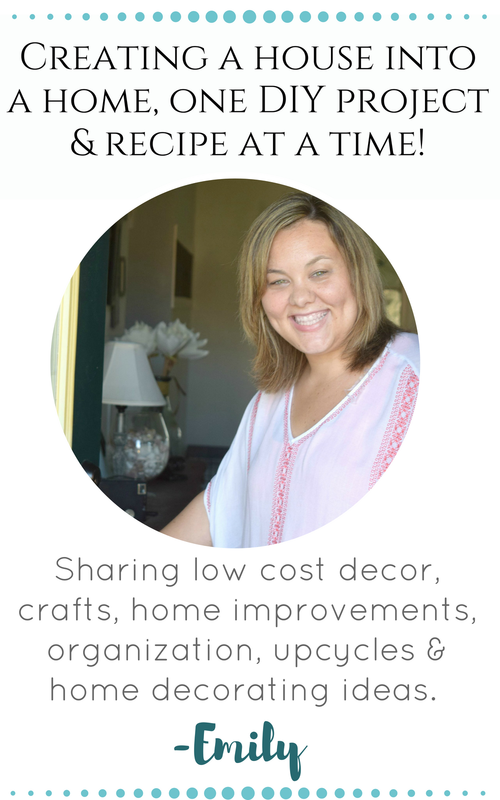 Next week I will be sharing another portion of the remodel. 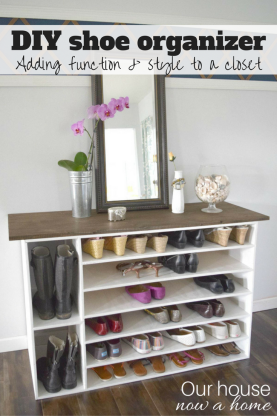 What is your favorite way to add storage? 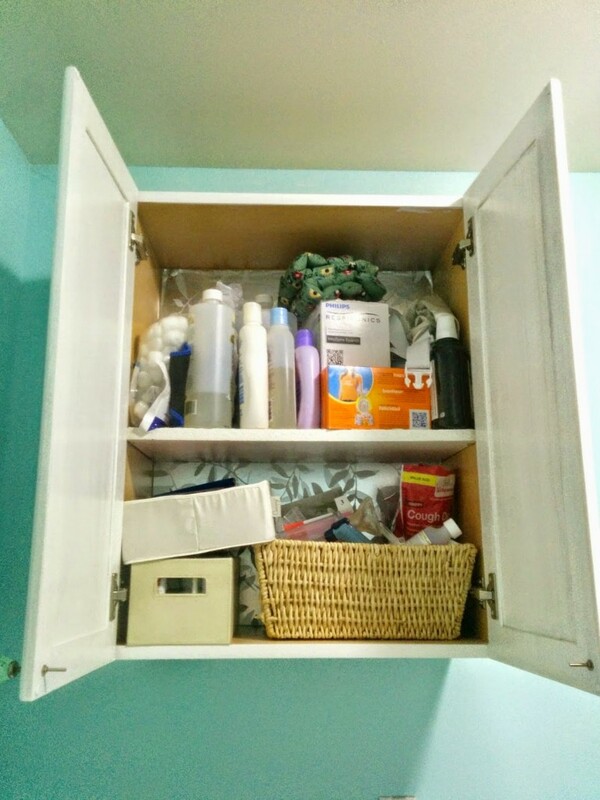 Is there a room in your home that desperately needs more storage options? Love it! Everyone needs a happy place to do laundry . . .it is more likely to get done with a smile on your face that way! Looking forward to seeing your space transform! Thank you! These were not too bad at all, the bar support helped a lot. I just had to hold them with one hand while my husband drilled them in. I am hoping my laundry room see's some more progress soon! You do have a Stud in your cute Hubby. That is for sure. Love his hair! As always I LOL'ed in a lot of places, "the worst back seat project person ever", so funny. Neat post! Love love love those door handles! We added some cabinets in our kitchen last fall. We're a family of five, and we homeschool, and there's just never enough storage space. Thank you! I am in love with those door handles too. They are a little more green than I had planned using, but I could not resist them when I came across them. I have three kids, also and every nook and cranny in our home is used for something. Storage is a MUST! Thank you! The wrapping paper was a last minute idea, I was not even sure if it would turn out. 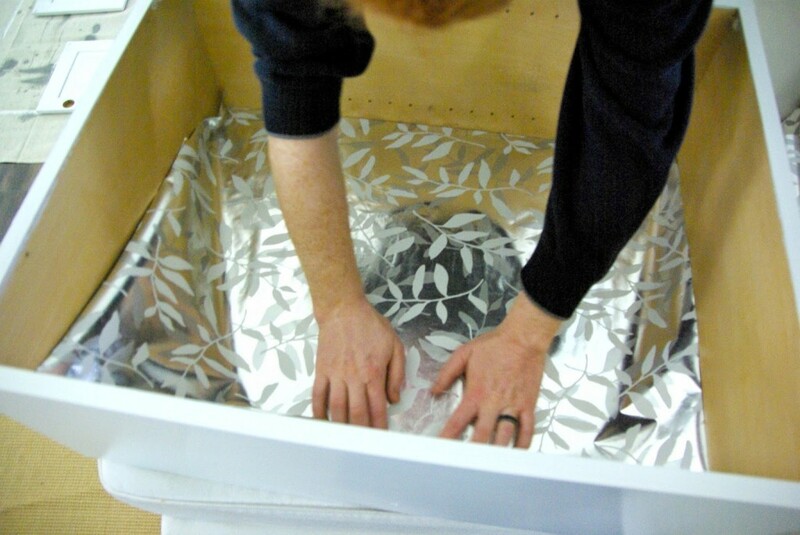 Contact paper is a great idea as well. Thank you, good luck on you project! This looks like so much work! 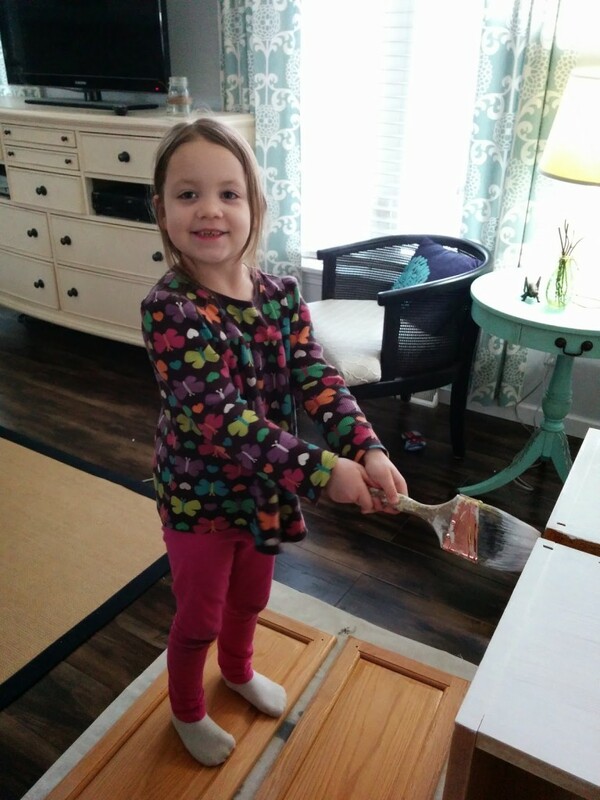 Haha, love the pictures of your kiddos helping out. That concentration is adorable! Love the knobs too! This was not too bad of a job, a lot of steps but none of them too complicated. 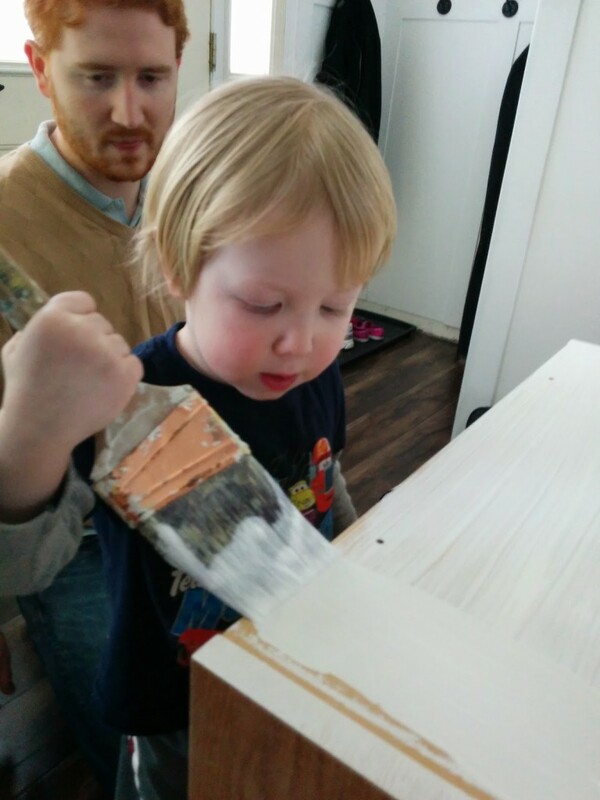 My kid's are always eager helpers when it comes to painting. this looks great! I love the knobs, too. 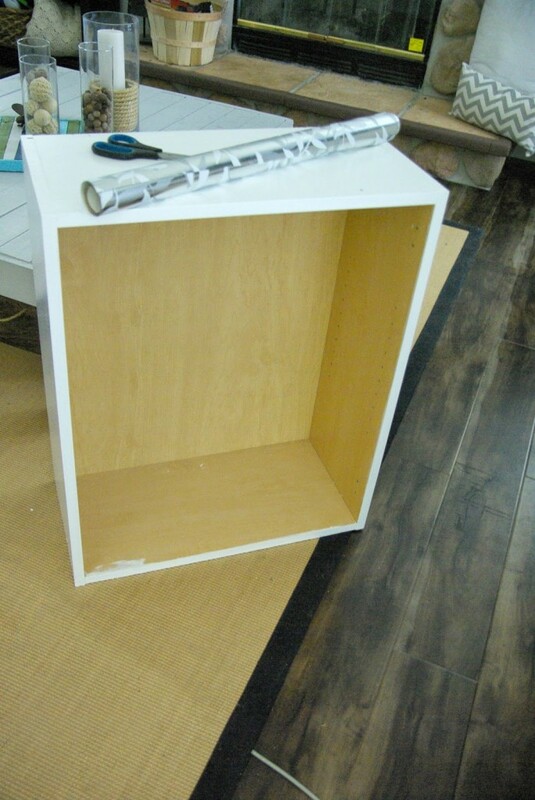 I can invision free standing shelves in between the cabinets with pretty picture frames, baskets or what not on them…. I've never done them, but I hear they're easy. 🙂 Great job on hanging the cabinets. You read my min Leighann! We are going to be putting in open shelves in between the cabinets. It is a big blank wall, I might as well fill it with "stuff". And those knobs. Don't even get me started. I want to steal them from you. So beautiful. Did you say Harry styles???! Thanks for stopping in Hannah! 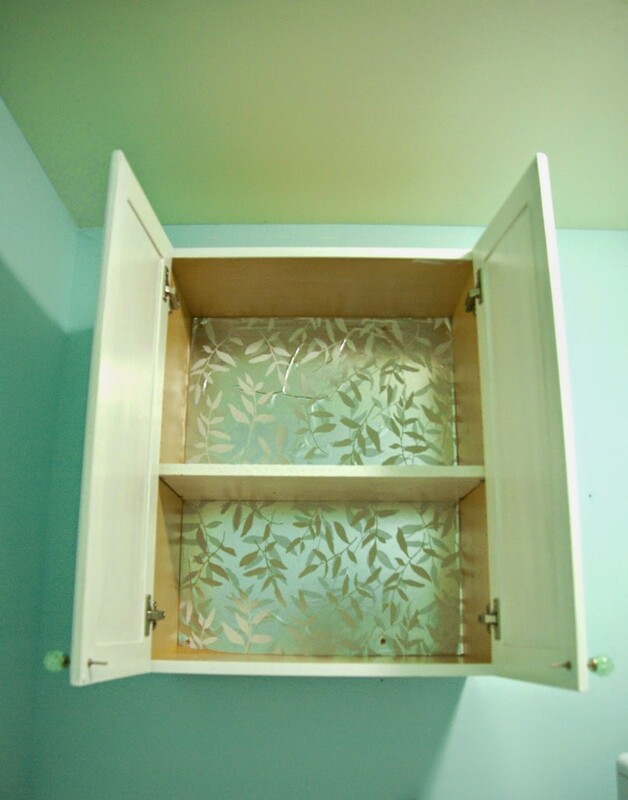 Love that you painted the cabinets white – and those little green knobs are adorable! 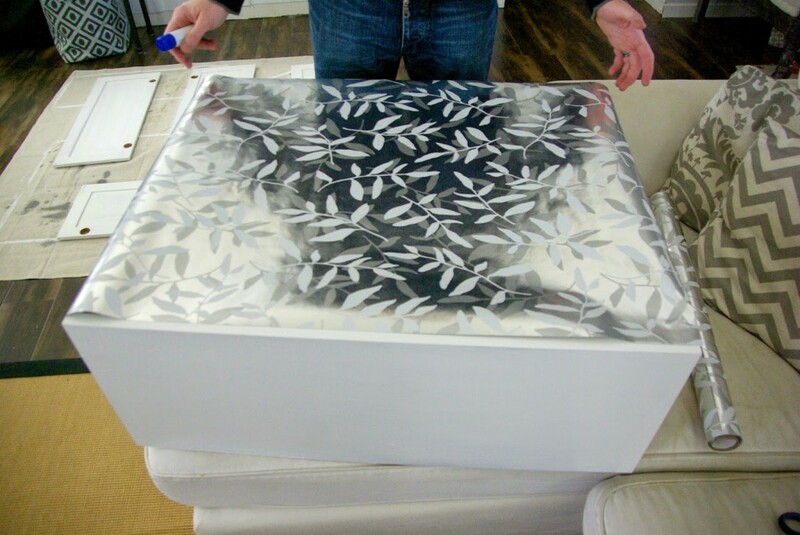 What a great (and cheap) idea to use wrapping paper inside! 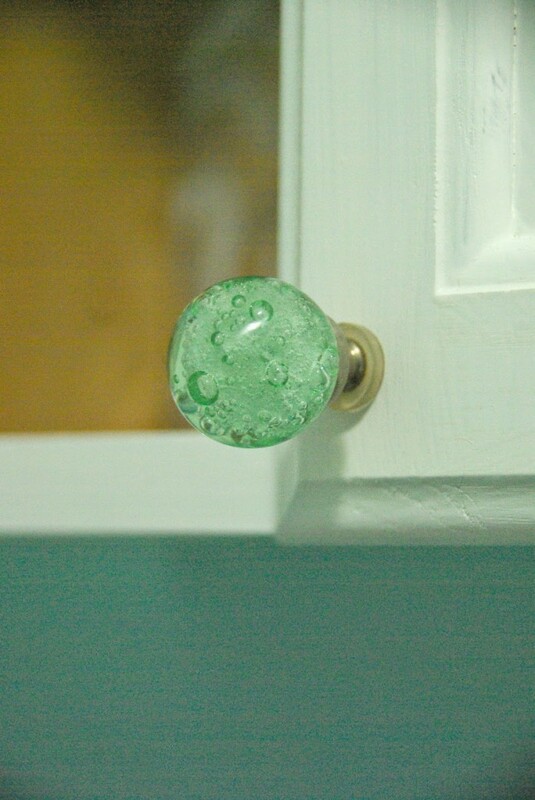 Those little green knobs were so cute, I had to have them!